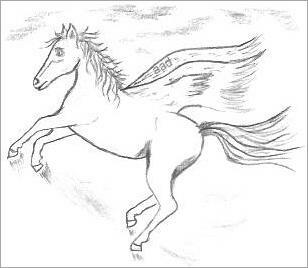 It's time to add fantasy drawings of horses to our fantasy family. I enjoyed creating these images even though the complexity of animal shapes is a little beyond my capabilities at this early stage of hobby artistry. I rely completely on sight to copy the outline and to gauge correct size. My rough sketches are probably not true to proportion but it is all a work in progress, I first concentrate on learning to draw before delving into the finer principles of art. This fantasy horse head was truly easy and I think you would also have good success should you copy it. 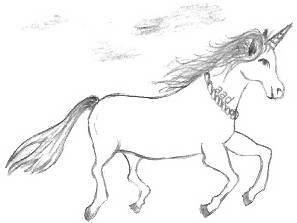 I found some old drawings to get a few ideas and then the challenge lay ahead for me to create my own fantasy horses. 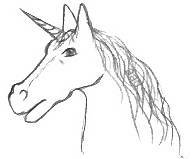 I ask myself... Can I copy a drawing of a fantasy horse and get a good likeness? Well, I'm not one to wonder for too long, so I picked up my pencil and away I went. When I drew the full horse figure, I had to erase the legs a few times but I'm satisfied with the final drawings. That's all I need because the quest here isn't to be perfect the first time around. I know as I continue practicing that I am improving all the time. I also know that my desire to draw gives me an edge and helps me to succeed. You will find these fantasy drawings of horses are fairly easy to copy although drawing animals of any kind can be daunting to beginners. You might think these horses look like unicorns but I consider them to be one and the same. The unicorn is known to be a big part of medieval legend and art. It gets its name from the single horn on his forehead. There are many drawings to be found in the public domain archives that you can copy without standing on any copyright toes. Using material that has no copyright is the safest way to practice drawing from existing artwork. 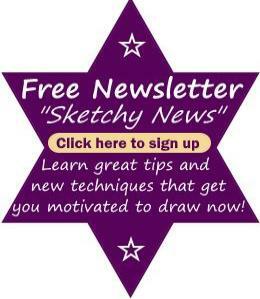 Alternately, you can draw upon your imagination to create fantastic images. You can use bits and pieces from lots of drawings but that is still something that you need to be careful with if the artwork currently belongs to another. If you are wanting to draw only for yourself with no intention to sell, then it is fine to copy anything you like. Write all the details on the back of your drawing, things like who was the original artist, what book you copied from and then sign and date it for your own records. For this drawing, I put a few smudges in the background to give the impression of clouds and some light lines to indicate flight. Fantasies are stories that don't exist in real life so when I sketch my fantasy drawings of horses, I consider including things that also belong in fantasy land. In this drawing, below, I put a castle in the background. That is only one of many ideas because you can elaborate as much as you like in your drawings. 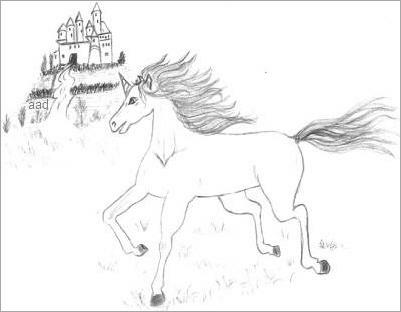 Fantasy drawings of horses are easier than most because no shading is required. Unicorns are normally white but there's no rule saying you can't draw a black fantasy horse. I start by roughly sketching the lines of the head and then I draw the back so I can compare the angle of the lines. Once I am happy with those lines, I sketch out the legs, trying to get the length right in relation to the body. You can use your pencil to help measure the width of the body and estimate how much longer the legs need to be in relation to it. I am a tad impatient to see my results so I like to look and copy, without too much fiddling. You can do a rough outline using block shapes and then sketch over them, rounding off as you go. Throughout this site, I discuss various methods like blocking in for you to experiment with, to help establish good drawings. It only takes a little time so be patient and you will eventually find one that suits your style.